This week, my friend asked me to help her decorate for a baby shower that her family is hosting. Of course, I am super excited to help create one-of-a-kind decorations that are inexpensive and eco-friendly! 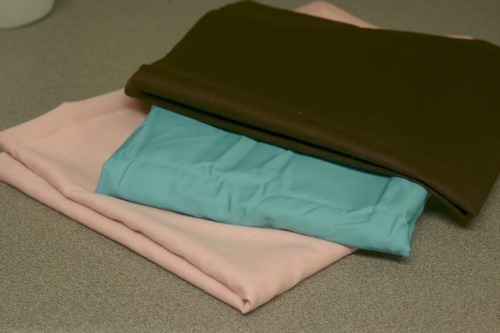 Instead of using new fabric, though, I went to my local thrift store and bought old pillowcases and curtains in the colors that the mom-to-be wanted (brown, teal, and pink). 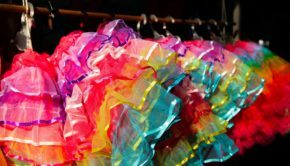 Here’s how you can make your own upcycled fabric banner! 1. Fabric. Like I mentioned before, I went to the thrift store to get mine. 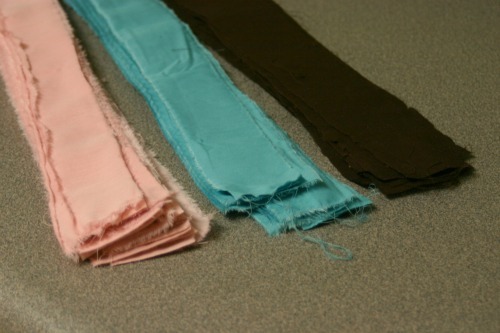 The teal pieces are from a pillowcase, the pink pieces are from a curtain panel, and the brown is simply fabric. 3. Twine. If you can, use hemp twine, it’s more eco-friendly. 1. 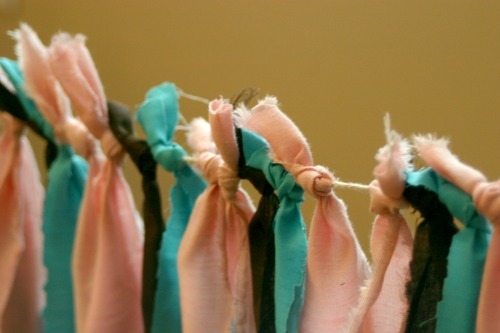 Cut (or tear) your fabric into strips. Try to make sure they’re all the same length. 2. Determine how long you would like your banner to be. Mine will go on the mantle of the host’s home, so I made mine fairly long. 3. Then, cut your twine. Make sure you leave a little extra on the ends for hanging. 4. As It’s Overflowing mentions in her tutorial, it is easier to tie the fabric to the twine if the twine is suspended. 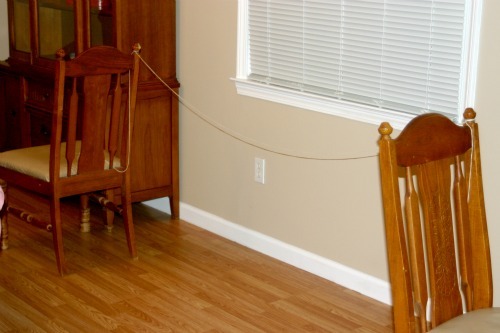 I tied/taped my string between two of my dining room chairs. 5. Then, tie your fabric onto your twine. I just tied one piece of fabric onto the twine at a time. My pattern was brown, teal, pink, and pink. I used two pinks because she’s having a girl and because I had more pink than any of the other colors. 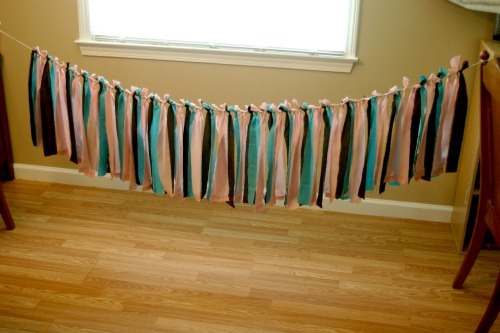 Once you’re finished tying all of your fabric to the twine, you have a gorgeous and eco-friendly banner! 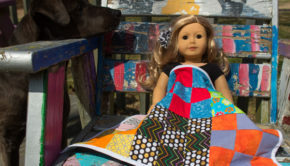 This banner was incredibly easy to make and you probably have all of the materials on hand! It definitely beats the not-so-eco-friendly generic banners at big box stores. I also plan to add the baby’s name (Ava) to the front of the banner so that the mom can use the banner in the nursery as well! Bridal showers— use the bride’s favorite colors or her wedding colors. Graduation parties— find out the school’s colors! Weddings— use the wedding colors and then add a banner with the couple’s names in front. Birthday parties— choose the birthday boy/girl’s favorite color, or, for children, find fabric with their favorite cartoon character. Halloween— use orange and black fabric for an awesome Halloween banner! Christmas— find some red and green fabric for a cute Christmas banner. There are so many possibilities! What are your ideas? Share them in the comment section below or on our Facebook wall! Great idea and tutorial! Thanks for sharing. I linked to it in my “green baby shower” blog post.